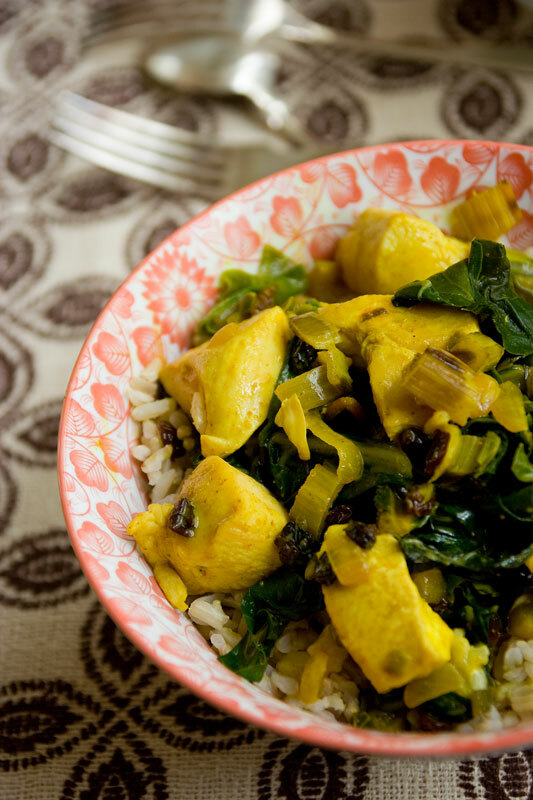 Friends, I’m here to tell you today this Chicken and Chard with Curry is a One-Pot-Wonder! It’s a super flavorful and healthy all-in-one dinner that just also happens to be gluten free, dairy free and paleo friendly. I originally shared this recipe on October 3, 2011. I have updated the images and some of the text today. 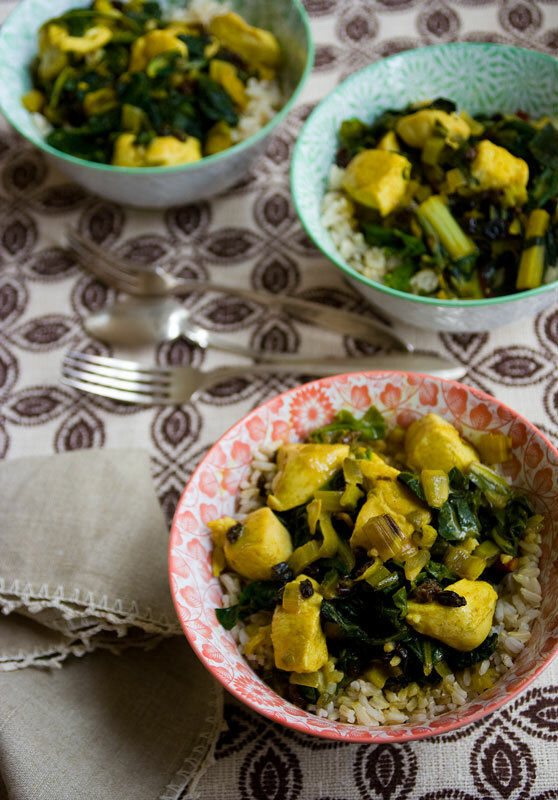 I was debating calling this recipe Chicken and Chard with Coconut, Curry and Currants but I felt like that was a bit heavy on the alliteration. Don’t you think? To be honest, I didn’t even notice that all of the main ingredients started with the letter “C” until I sat down to type it up. Honestly, the recipe came about because I have been repeatedly making simple sautéed chard with curry powder and currants. I just go bananas over greens. [I must be vitamin deficient or something because I literally crave greens.] So anyway, the gist of what I’ve been doing is just sautéing the chard stems and onions in oil, adding in curry powder and currants and then finally wilting the greens. It is so simple but full-flavored. I have been loving it as a simple side-dish all season. So it made sense to share it here. But then I realized it seemed like a great opportunity to make a healthy main course. So I added chicken for lean protein and light coconut milk to make a sauce. I served it with quinoa. I had to restrain myself from pairing it with Couscous or anything else starting with the letter C.
Coconut Milk- I reccomend buying “light” coconut milk. It still adds creamy coconut flavor, for far fewer calories than full fat coconut milk. Some common brands are Thai Kitchen and Native Forest. Shake the can before you open it, as the creamy fat rises to the top. Shaking it will help disperse it again. This recipe calls for 3/4 cup light coconut milk so you will have some left-over. But good news, you can store left-over in freezer. Curry Powder– There are many many types of curry power out there. And they are all wonderful! 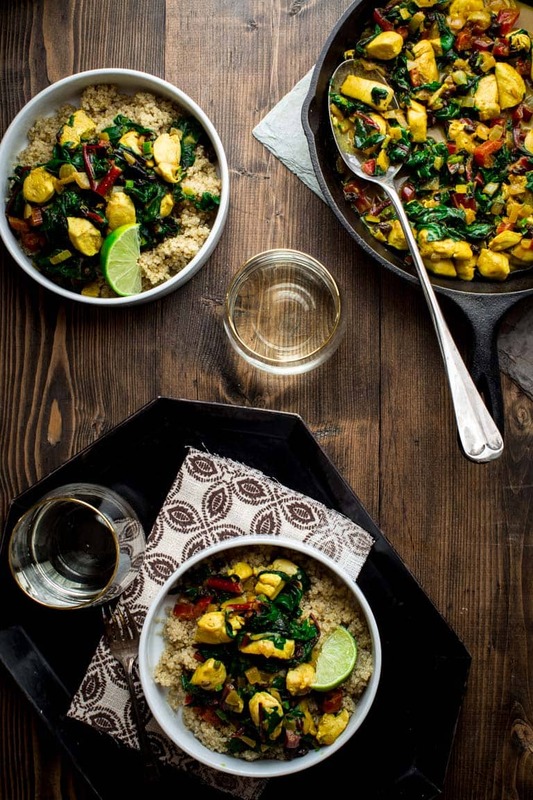 This recipe is intended to be made with Indian style curry powder. 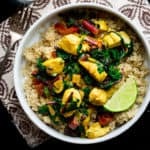 In the regular spice section of the supermarket, you’ll likely only find two or three different types of Indian style curry: Garam Masala, Madras and Curry Powder. But if you are interested there are a lot of really interesting specialty curries. I used British Curry by Teeny Tiny Spice Company in this most recent batch. If you like a bit of heat, go for Madras or Hot Curry. I like to buy my spices in small amounts in the bulk section of the health food stoer so they are fresher. 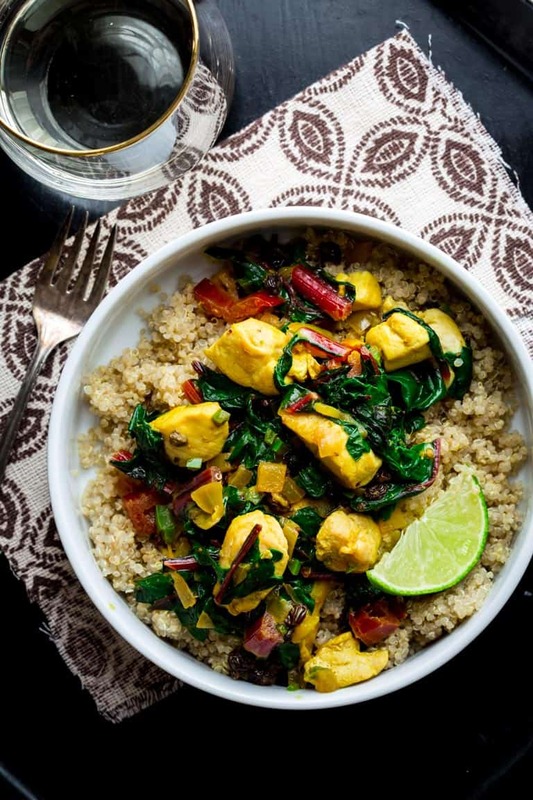 To Prep and Cut the Swiss Chard– You can use rainbow, white or red chard in this recipe. Cut the stems off and chop them into small pieces (the same size as the onion is good in this recipe.) The stems are delciious but need to cook longer than the leaves. Set them aside. Then chop the leaves into pieces, 1 to 2 inches is good. Then wash the chopped leaves as you would lettuce. Spin dry. I wash the stems after they are cut in a strainer in a bowl of cold water. The grit will fall to the bottom of the bowl. Lift the stems out. 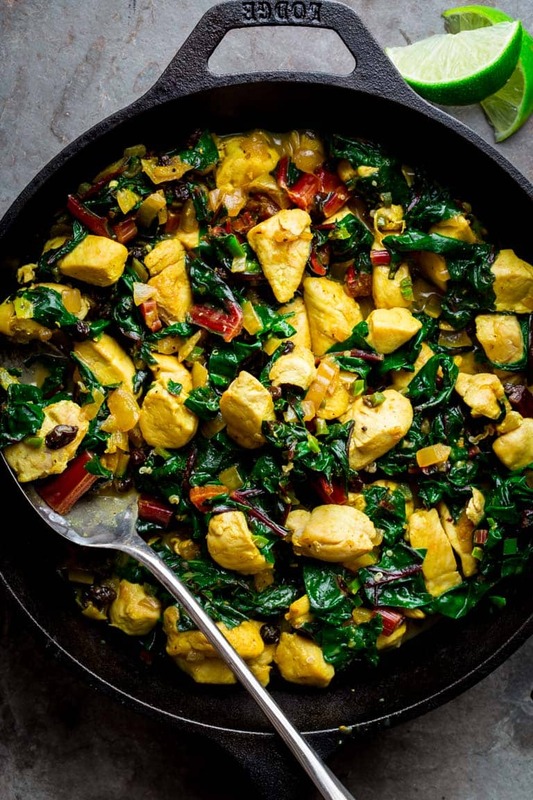 This Chicken and Chard with Curry is a One-Pot-Wonder! 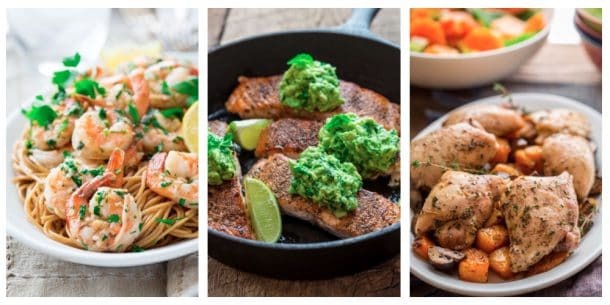 It’s a super flavorful and healthy all-in-one dinner that just also happens to be gluten free, dairy free and paleo friendly. Heat 1 tablespoon oil in a large non-stick skillet over medium-high heat. Spread chicken out in one layer, sprinkle with ¼ teaspoon salt and cook, stirring occasionally until browned, 4 to 6 minutes. Remove to a plate. Note: the chicken will not be fully cooked at this point and will continue cooking in a later step. Increase heat to high, stir in coconut milk, currants, the chicken and any accumulated juice from the plate and bring to a simmer uncovered. Reduce heat to maintain a lively simmer and cook, stirring often until the sauce is thick and the chicken is cooked through and hot, 3 to 5 minutes. Stir in lime juice before serving. 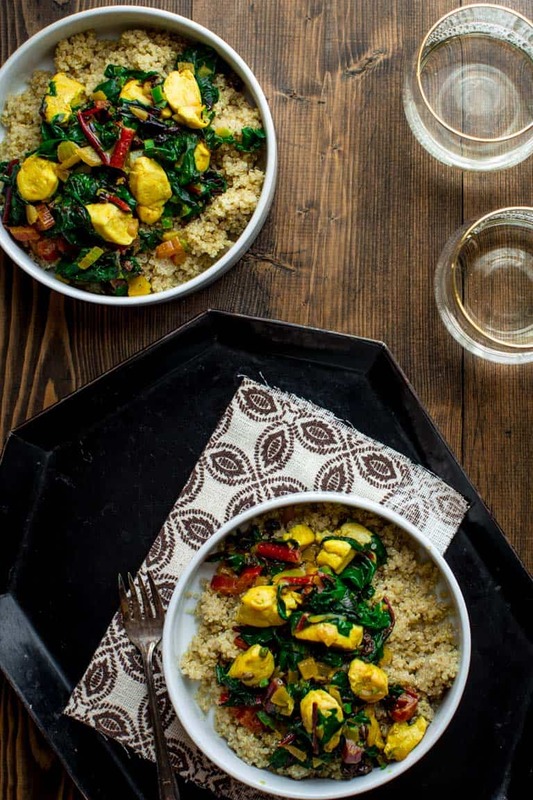 I’ve been looking for a new chard recipe and this is it! Yes! This recipe was from before I really fell in love with coconut oil, but it would be an obvious choice here for sure. Thanks Ceci. 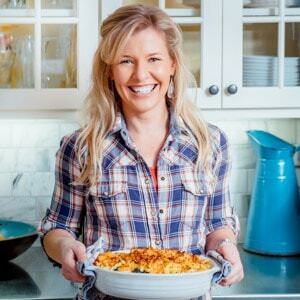 Well, I simply love this recipe, I pinned it to make it this week. I love chard very much but I don’t use it in so many recipes. Thanks for sharing it. I love it!! 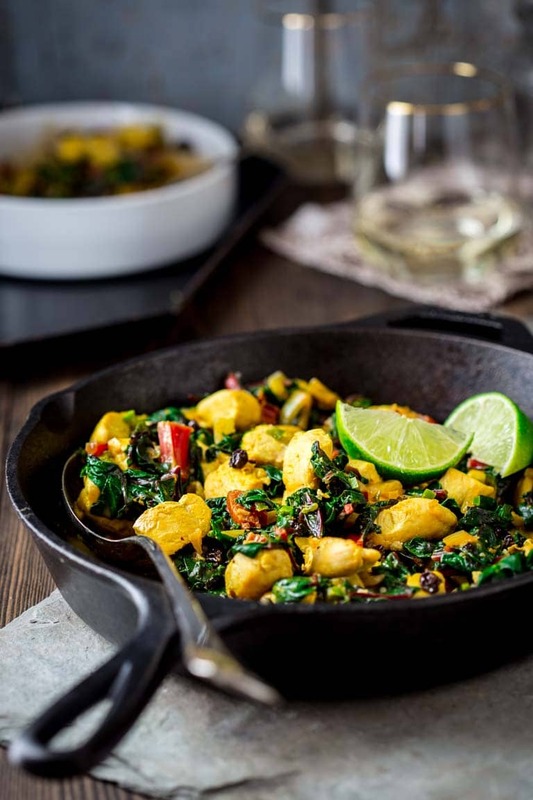 Love finding one pot/pan dishes that are loaded with veggies and healthy proteins! What a delicious recipe! I am so with you Sarah Jane. They are a life saver! Yum. That looks amazing. I’m making this one asap. So glad to hear it! It is a favorite flavor combination for us! I have never made a curry before. This is a great photo that is getting me inspired to branch out. Absolutely gorgeous colors and I’m a sucker for anything featuring curry! I made this tonight as a friend gave me Swiss chard from her cya box and I didn’t know what to do with it other than the usual wilted greens thing, This is delicious! I love it. No grains or other side needed. Yum! Thanks for sharing. I love all the flavors in here. I can almost smell the wonderful fragrance! Hi Kelly. That’s a good sign if you are imagining that!